Like most Southerners, we desire to live comfortably, and love the prospect of entertaining. Even more so, as Southerners, we're a touch sentimental, if you will... what belonged to our families feel sacred and and unabashedly stylish. It's true that each trip to visit my parents' results in my hunting for something of my grandparents to bring home with me. My mother has now taken to looking through my bag before I leave. Living down here just makes you appreciate the past. It’s everywhere. As custom framers (and proponents of all heirlooms), we are lucky enough to consistently work on projects that mean a great deal to our customers, on pieces that stand as a tribute to the equally remarkable memories intended to preserve. 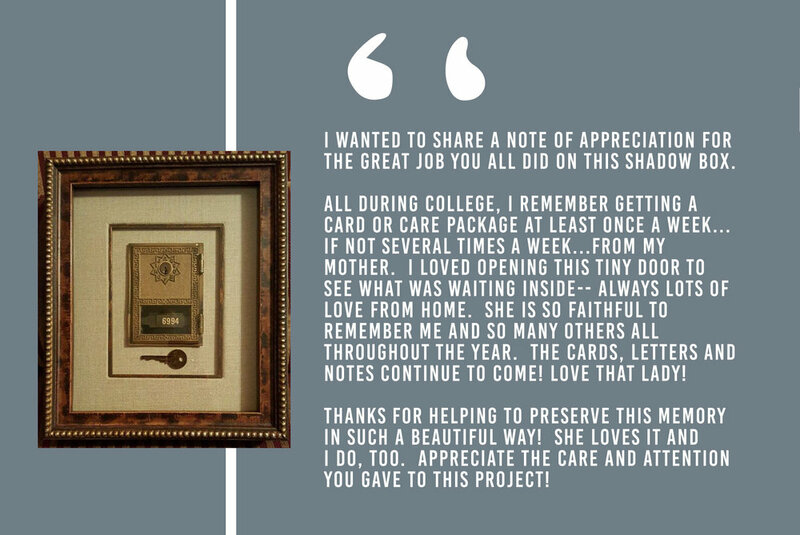 We’re beyond passionate about this and we’ll work tirelessly to ensure every detail is considered - so when we receive praise like this, we have to share - and to encourage you to preserve a few memories of your own. So to Michael (whom shared the kindest of words below) - you shouldn't have! But we're so glad you did. p.s. if you're interested in the story that inspired the framing of Michael's Wake Forest mailbox, check out the article here!